When Gertie Reece Foy learns of her mother’s plan to move away from their small Alabama town, Gertie hatches a super awesome plan: become the greatest fifth grader in the universe! Once that is done, all she has to do is convince her mother to stay. Of course, it’s not all that easy, but Gertie never gives up. She is ready to become the smartest in her class. However, the new girl, Mary Sue, messes things up. Then it becomes an intense competition between Gertie and Mary Sue to see who will end up on top. As Gertie weaves her way through fifth grade and deals with mistakes and failed plans, she finally discovers that she is Gertie, and nothing can change that. 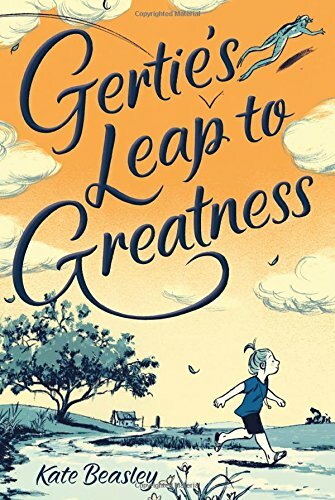 Gertie’s Leap to Greatness is a well-written story about fifth-grader Gertie Foy. Gertie’s parents do not live together, and although the book never mentions it, it can be assumed that they are divorced. Gertie lives in Alabama with her dad and Aunt Rae. This book was written with clarity and is surprisingly visual. It was effortless to envision the settings in the story. The artistic illustrations that filled the book were a noteworthy asset to this moving story. Covering a variety of emotions, the author focuses on competition and friendship. The climax of this tale is wonderful as it presents the message that each of us is unique and special. I would recommend this book to anyone under the age of eleven. Being thirteen and reading about a fifth grader made the story and characters a bit difficult to relate to. Even so, it was a pleasurable and uplifting read. Follow Gertie to the highs and lows of fifth grade in Gertie’s Leap to Greatness!